http://www.opendoorstudio.blogspot.com for more fun Chirstmas ideas! The inspiration was the artist Kim Parker and my mothers Art box. 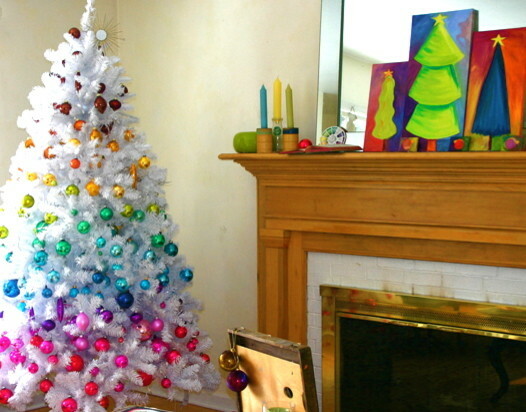 I developed a chroma of color on the white artificial Christmas tree by layering vintage shiny brite ornaments in a palette of color. After completing the tree, I painted 3 whimsical trees to accompany the Art box inspired tree. My mothers vintage wooden art box decked out in the center of the room with colorful modern Christmas tree balls bursting forth. I added artful touches throughout the room for a fresh take on Christmas decor. To colorfull,better for a sweet shop or carnival!!! - Whoever agrees,like this comment !!! I don't believe there is any law on Christmas decorations. I love this, it's in my Christmas idea book. I already have a tree for each room, but I really want this too! Just ignore bad comments. : ) Merry Christmas! Have a great day! Would also look good with variations of the same color. Maybe from light to dark. Inject a little life into your space with wild rainbow colors, white branches and lime-green paintings of miniature trees. Take Down and Store Holiday DecorationsApproximate time: 4 to 5 hours; this job can be done in separate segments — storing and organizing wrapping supplies, taking down the tree, putting away decorations. Materials needed: Storage boxes for ornaments, lights and wrapping supplies; cleaning supplies for wrapping station, broom, dustpan, vacuum, scissors, hole punch. I love the art on the mantel. So colorful! Christmas tree is also lovely. Pride Tree! Upstairs or downstairs?